The permanent slip owner didn't show and we departed at 4 AM. We pulled our crab traps located just north of Craig off the fish processing plant to find 10 good looking ones. When it comes to crabbing, there's just no gender equality so all 10 females used their "Get Out Of Jail Free Because I'm A Girl Card". To be fair, the girl crabs keep making more crabs so there is a good fishing reason to free them. We were hoping the open ocean King salmon fishing spot west of St Joseph Island would be comfortable this morning but it was wishful thinking as the higher wind and sea forecast made for a rocky ride. 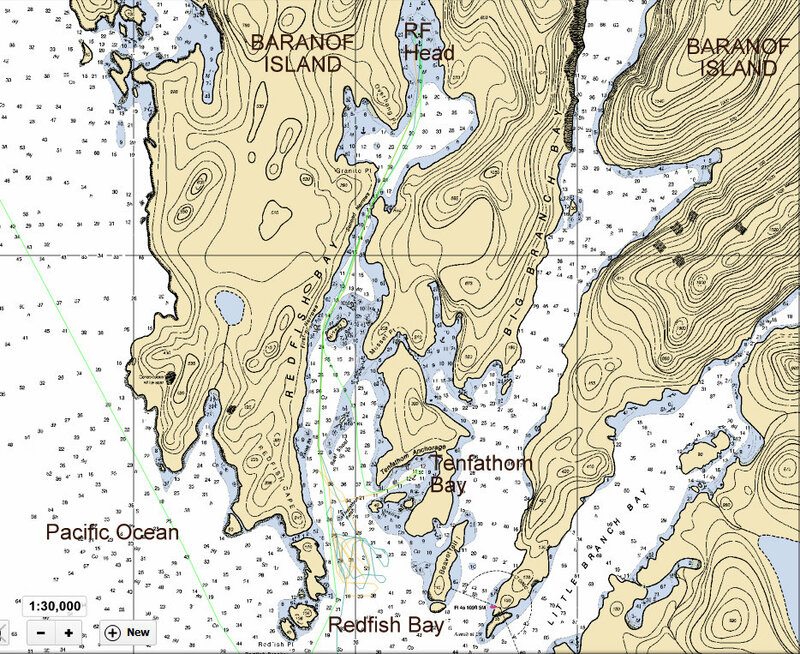 We settled on trolling Sonora Passage. It was less windy and not so bumpy but the fish weren't there. By 8:30 we motored up again headed for Port McArthur on the SE side of Kuiu Island. Crossing Sumner Strait was another bumpy ride and we were happy to set the anchor and two halibut rigs in the Port. Although we had seen only a single boat this morning, two others showed up later to share the anchorage with us. 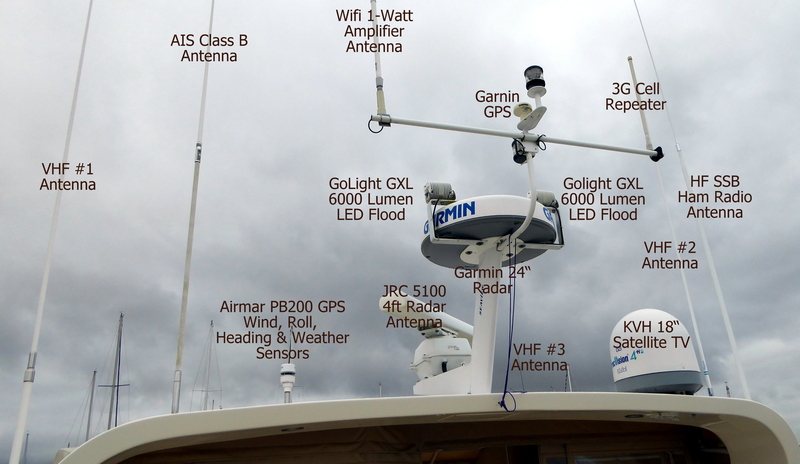 A boat called Scorpius was loaded with many 200 gallon propane tanks, and a helicopter. Once the wind lessened, the copter took off from the boat and headed southwest into the Kuiu Island forested hills. Soon it was back to hoist a propane tank. Later it returned with an empty tank. The tank shuttle activity continued for a couple hours as about 15 tanks were transported ashore to some installation. Have gas will travel! Scorpius with propane and helicopter. Tank on the move. Please don't drop it. Alex and Sid enjoy prawns and pasta. Sunday's short stop in Craig netted us another crew. Shawn McNamera flew in from California to join Roger Larsen and Sid Findley completing this leg's crew. 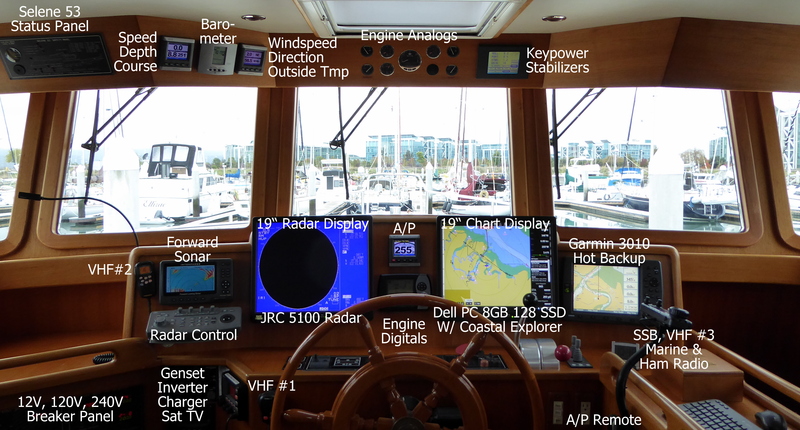 Roger and Sid have cruised on Wild Blue many times including portions of this years's trip from Anacortes, WA. This is Shawn's first time aboard and we have on good information that he's an excellent fisherman and outdoors-man who enjoy's boating. Shawn is in his final year at Chico State and is a partner in successful sporting goods store. His father Dave was a regular Wild Blue crew. initiation of downing fresh King salmon roe. 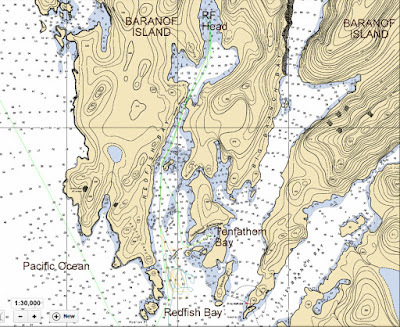 Our regular 4 AM start from Port McArthur assured we enjoyed the best conditions for crossing Chatham Strait and rounding Cape Ommaney on Baranof Island's southern tip. We pulled a couple empty crab traps but noticed a few of those pretty sea otters with fresh crab breath. It's a given in SE Alaska: if you can see an otter, there just won't be any crab around. After 40 minutes we cruised past Cape Decision and her handsome lighthouse entering Chatham Strait. We steered to round Cape Ommaney. The conditions were nice: slight 3 foot swell with light winds. Six miles in front we saw a cruise ship. AIS identified the ship as the Celebrity Infinity which just days ago slammed into City Float, poking a hole in here hull. The hole repairs commenced within a few hours of the mishap and she continued in service. Port McArthur sunrise looked to forecast a nice day. Celebrity Infinity just off Cape Ommaney entering Chatham Strait. You can hole her but she stays in service! We approached the Cape just before 8 AM. The seas built up just a bit but the ride stayed nice. Baranof Island's west side showed the beauty of high surf and the windswept shoreline. Amazing there are many calm anchorages in the mist of stormy weather on this rugged ocean coast. With our great weather we pulled into Redfish Bay and troll a bit. We enjoyed lunch at anchor at the head of the Bay 3 miles inland from the mouth. After landing two halibuts, we anchored for the night in Tenfathom Anchorage a calm spot, nearly landlocked yet close to the Bay entrance. From their we enjoyed the pretty scenery, fried fresh halibut and a quiet night at anchor. Seals enjoy the surf and sun on Baranof's west coast. The view to sea just outside Tenfathom Anchorage.